Two women who want to use frozen embryos against the will of their former partners will have their case heard at the High Court in June. Natallie Evans and Lorraine Hadley are challenging, on human rights grounds, a law which says both parties must consent to the storage and use of the embryos created from a man's sperm and a woman's eggs. 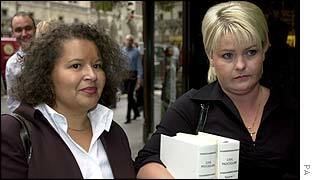 Solicitors acting for both women confirmed on Thursday that trial has been set for 30 June. The case, which is the first of its kind to deal with the status of an embryo and the rights of the parties who have undergone IVF, is expected to last five days. Ms Evans, 30, of Trowbridge, Wiltshire, had six embryos frozen before undergoing cancer treatment, which resulted in her not being able to conceive naturally. Ms Hadley, 37, from Baswich, Staffordshire, is bringing a similar action against her ex-husband. She has a 17-year-old daughter from a previous relationship, but suffers from fertility problems because of a medical condition. Both women say the frozen embryos represent their only chance of having a child. Solicitor Muiris Lyons, who is representing the two women, said the case raised complicated issues involving the Human Fertilisation and Embryology Authority (HFEA) and the Department of Health. "We now have a date, at the end of June, and everyone is working towards so this very important case can be resolved," the solicitor said. "Natallie and Lorraine are both very pleased that a date has not been set."